"Adventure, exploration, and solitude await you in this beautiful mixed-pine and hardwood forest. A keen eye may spot an American Alligator or Bald Eagle. Listen for the screeches of Pileated Woodpeckers or simply smell nature at this historic Civilian Conservation Corps (CCC) built park." The next phase of our Southwestern trip has begun. We've traded free-range longhorn cattle and sandy, rocky trails for reclusive alligators and sandy, rooty trails this week. In four trips here, we still haven't seen any alligators! 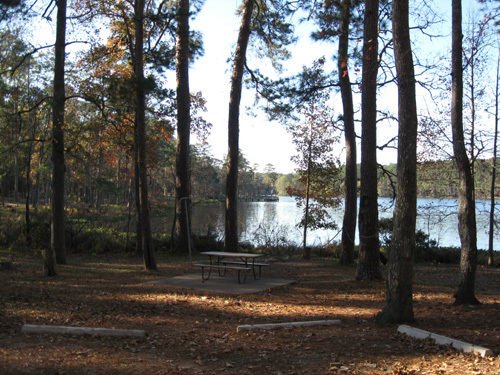 On Monday morning we drove about 120 miles east of Fort Hood to Huntsville State Park, an hour's drive north of sprawling Houston, TX. This is our second time camping here this year; we spent a week in a nearby site in the same campground back in early February for the Rocky Raccoon 100-mile trail run. Now we're here for the Sunmart races. One of our best decisions in February was purchasing a Texas State Parks annual pass. We more than made up the cost in waived entrance fees in five days at Huntsville and a second week on Galveston Island -- AND the pass is good through the end of February, 2009. When we arrived at Huntsville SP on January 31, the staff clued us in to the fact that the pass would be good for 13 months, not 12, if we waited until February to purchase it. We are grateful for that tip. We'll continue to save on waived entrance fees at least three more weeks when we're at various state parks during this trip. The entrance fee is $4-5/day in the parks where we've stayed so far. The parks pass is a real bargain for anyone living in or near Texas or even for those who want to enter one or more of the numerous Texas state parks several times within a 12- or 13-month span of time. Just remember to get it near the beginning of the month and not the end so it'll last longer. There are more savings, too. After we got home in February we received four coupons for 50% off one night of camping with a minimum stay of two nights per visit. We were able to use one of those this week even though we have a discounted weekly rate (stay for seven days, pay for six). So our already-inexpensive $96/week camping fee came down to $88. And we can do that two or three more times this trip! Our cost is a tiny bit higher here than at Fort Hood but still a bargain. There are also discounts for park stores but we haven't been to one of those yet. I think I should get a discount for being such an enthusiastic supporter of the Texas state park system! It would have been nice to arrive here a week earlier but when we called in August to make reservations we learned that Thanksgiving week was completely booked months before that. Why? I finally asked this week and we were surprised at the answer: lots of people like to camp here during the holiday. We never would have guessed. Doesn't everyone go home to Aunt Alice's or Grandma's house at Thanksgving?? Obviously not, and we haven't done that for several decades, either. 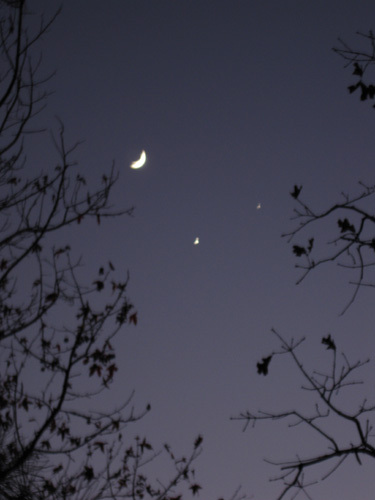 If we want to get here earlier next year we'll have to call soon; you can make reservations eleven months in advance. This week we've learned just how small is our window of opportunity for camping here during the winter. First, I'm not sure we want to deal with the crowd during the Thanksgiving holiday. Now we've learned about five other weeks in the winter that are closed to us. In February we weren't aware that all those little wood-frame structures throughout the park are "wildlife viewing stands" which double as deer stands during public hunts (to control the prolific deer population). It dawned on us when we hit the trails Monday afternoon and noticed that some of the 20+ stands are now adorned with camouflage fabric (above) to give the hunters more cover. That made us wonder when deer hunting is allowed -- turns out, the last three weeks of December and the first two weeks of January. Folks can camp on weekends but not during the week. Our timing here for races in early December and early February are like bookends to the hunting season so we can't extend those weeks by much. The past four nights we've had the place pretty much to ourselves. For convenience on race day we are camped in Prairie Branch, the unit closest to Raven Lodge. That's where both the Sunmart and Rocky races start and end. As at Rocky, we can just walk about two-thirds of a mile from our camper to the start of the race (our warm-up) and not take up one of the limited parking spots around the lodge. Meanwhile, there have been only one or two other campers in this unit with 30+ sites the four nights we've been here. There are maybe ten campers in the larger Raven Hill camping area. We love having the place to ourselves! 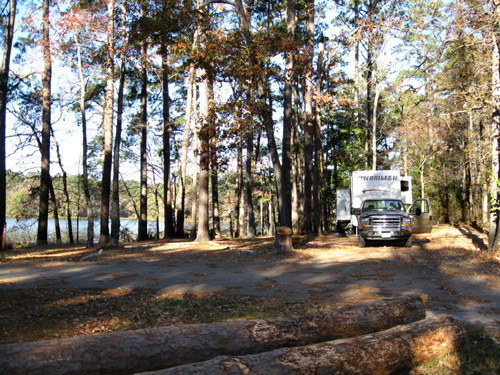 View toward our campsite and the lake; that's one of the trees felled by Hurrican Ike last summer. Best of all, our camp site is the closest site to one of the Sunmart aid stations, so I can check on Cody twice during the race and not lose too much time. I have over 11 hours to finish the 50K; I don't mind taking out ten or fifteen minutes (total) to feed Cody and let him out of the camper for a little while. Jim is more focused on his time, whether he does the 50-miler or 50K. He's vacillating between race distances. Runners can register or change races at Sunmart as late as packet pick-up on Friday. I'll write more about the race, our personal history with it, and our readiness to run it in the next essay. Now I'll focus more on this beautiful park and our activities in the area so far this week. 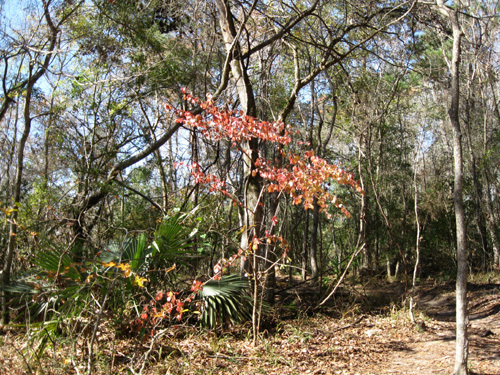 There are additional photos of the trails and further information about the park in journal entries dated February 1 and 4, 2008. 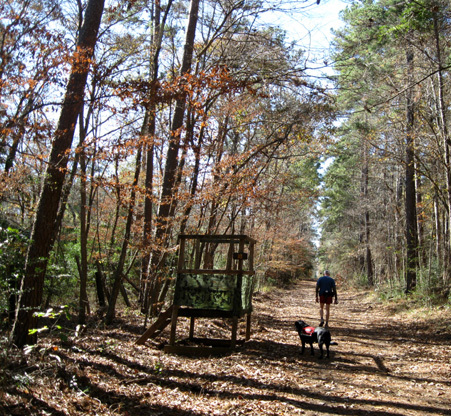 The multi-use trails at Huntsville State Park are great for hiking, running, cycling, and riding horses. 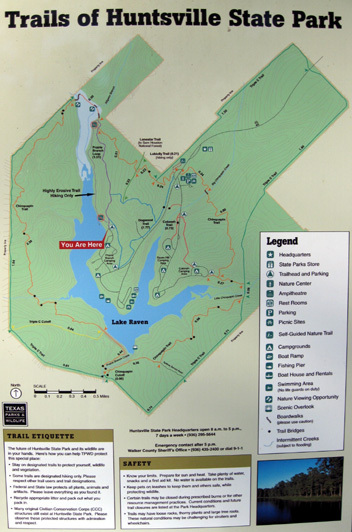 Over twenty miles of trail are open to hikers and runners, plus the paved roads into the park and through the campgrounds. The trail surface is much more runner-friendly than the bike trails at Fort Hood. Jim and I have enjoyed our runs, walks, and/or bike rides every day we've been here. 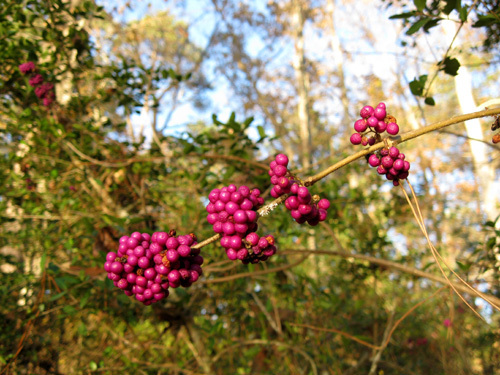 The 7-mile Chinquapin Trail is named for the big and little creeks of that name. Chinquapins are a type of oak tree that no longer grows here. 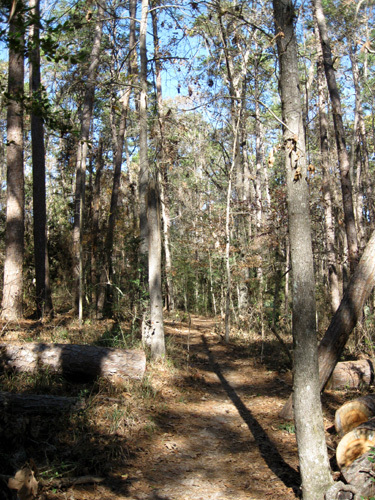 Section of Chinquapin Trail where a large tree came down during Hurricane Ike. 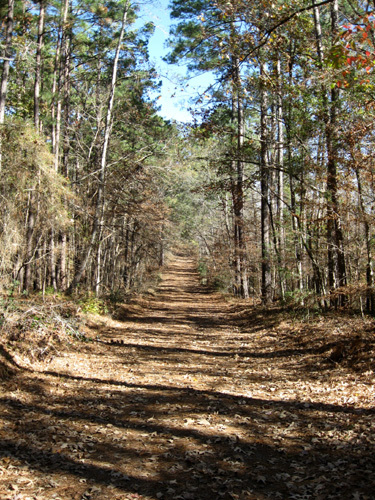 Triple C Trail, which follows the park boundaries, is partly jeep trail (next photo) and partly single-track. 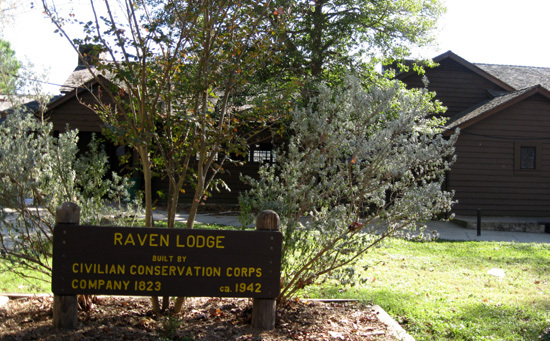 It honors Civilian Conservation Corps (CCC) Company 1823, the men who helped construct the park, lodge, and dam at the end of Lake Raven in the 1930s. Triple C is about 9.5 miles long. 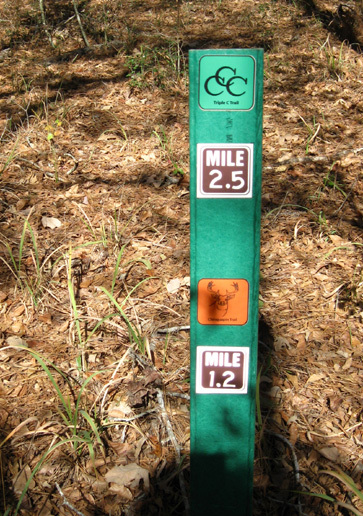 There are other shorter interconnecting routes that provide trail users with varying terrain and distances. 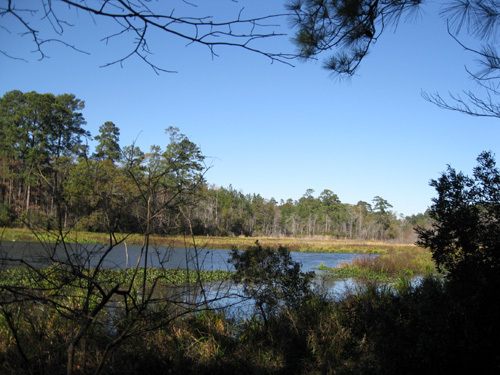 This area of central Texas is called the Piney Woods. 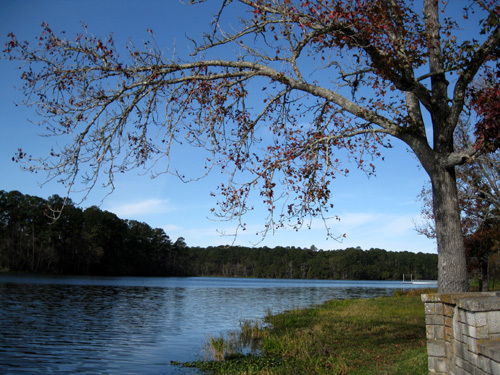 Huntsville State Park and adjacent parts of Sam Houston National Forest are full of loblolly pines, palmetto shrubs, and other plant life that remains green all year long. You can see pines in many of the photos above. Evergreen pines and palmettos contrast with deciduous autumn reds and oranges. There are also some deciduous trees and shrubs. When we were here in February the leaves had already fallen. In early December there is more color because not all of the leaves have fallen yet. I've never seen berries like that and haven't had time to search their identity. 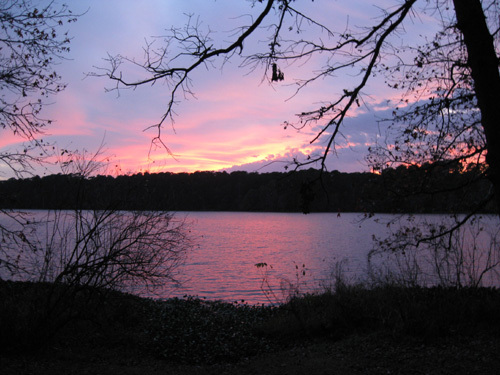 Huntsville SP is fairly hilly, with wetlands in low areas throughout the park and especially around Lake Raven. 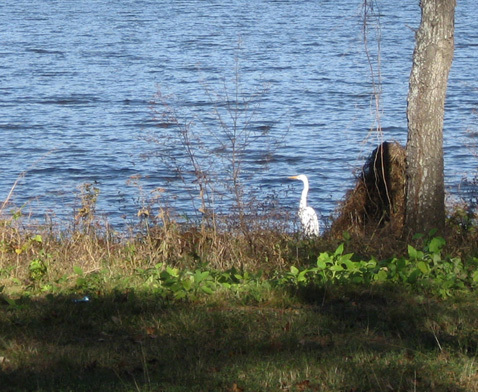 It's a great place to observe large water birds like white egrets (below) and blue herons. I haven't seen as many of those large birds this week as I did in February. We haven't spotted an alligator yet, but park personnel and local runners assure me they are here. Since we're camped pretty close to the water this time we're being more careful with Cody so he doesn't become gator bait. Higher ground in the park that is more dry has different plants and animals. It's fun to run in and out of the different eco-systems. That also makes the trails alternately wet and dry. Many of the wet areas have bog bridges to keep feet dry and plants safe. My biggest surprise this week is how sandy some of the trail sections are. I just don't remember that from the miles I ran and walked in February. I've been wearing gaiters on my training runs here and I'll use them in the race. The trailhead to my favorite short loop (1.5 miles) is adjacent to our campsite: the Prairie Branch Loop. The Sunmart and Rocky races both use this loop. 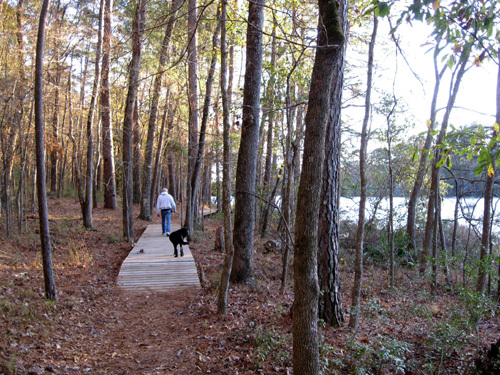 Half the trail is next to the lake; there are many wooden bog bridges in this low-lying area. The views of wildlife, wetlands, and water are superb if you're going slowly enough to take your eyes off the trail. This is the only part of the trail system where bikes aren't allowed -- the terrain is too fragile. The other half of the loop is on higher, drier ground where bikes can be ridden. In addition to forgetting how sandy the trails are, I also forgot how "hilly" they are. I'm not complaining; hills are good during a long run or race so I can use different muscles and not get sore from the same repetitive motions. My problem is that after routinely running hilly and mountainous trails for 28 years, I've been running much flatter terrain the last year or more to save my deteriorating knees. These hills don't hurt my knees. It's just that I'm not as capable of running uphill as I used to be. We'll see how that affects my race on Saturday . . .
We haven't had many other diversions our first four days here beyond shopping for supplies, doing laundry, and hunting for a YMCA that isn't just a child-care center (Huntsville's Y is only for kids). I have to have proof of working out at a Y at least four times a month while we're gone so I'll get my wellness refund from my former employer next spring. The closest Y is down in Conroe; we didn't realize that yesterday when we were in that area so we'll hit it tomorrow on our way to Houston for the pre-race dinner and briefing. We had a very pleasant visit yesterday with Tommy and Shirley Knight, who live near Conroe. Jim and Tommy served together in the same detachment in the Army for about a year in Viet Nam. They were there during the infamous Tet Offensive, when their compound was attacked. Both soldiers were radio repairmen. They have not seen each other or had any communication since April of 1969, when they were both back stateside (Jim was stationed at Fort Hood then). 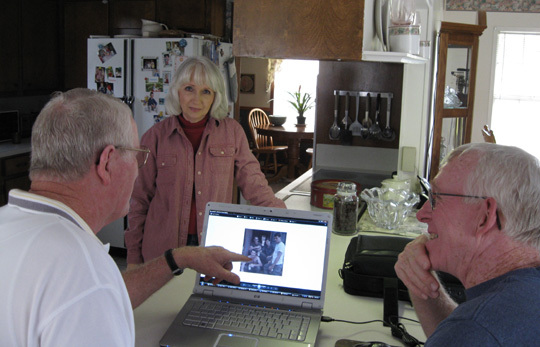 Tommy (L) and Jim look at old photos of their buddies in Viet Nam while Shirley looks on. Jim found Tommy's contact information through a search on the internet (fairly easy because Tommy and his wife have always lived in this area) and decided to call him after we arrived in Huntsville. 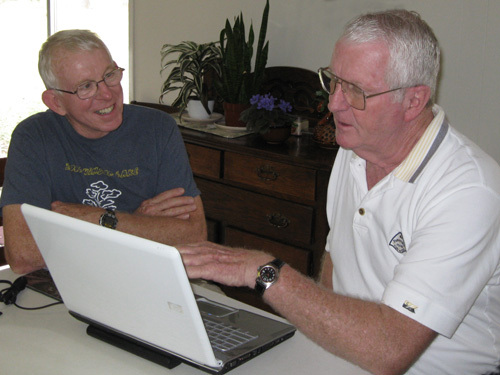 Tommy remembered Jim's name right away and the conversation flowed easily. The Knights are also retired so we invited them to lunch at the Olive Garden to get re-acquainted. Tommy suggested we go to his house afterwards in order to have more time to talk. Jim said he'd bring some photos; before we left for this trip, he scanned a bunch of his pictures from Viet Nam to share with Tommy on our laptop computer. Tommy said he'd dig out his old photo album to show us. As you can imagine, Jim and Tommy both had plenty of stories to tell about their shared war experiences as young men in a land and culture that was very foreign to them. I was so interested in hearing the stories and seeing the photos that I didn't spend much time talking alone with Shirley before it was time to go. We exchanged phone numbers and plan to get together again in February. Although the Knights graciously invited us to stay in their home next time, we'll still be in our camper then. We're looking forward to spending more time with them.